Henan, an agricultural province, lies in the middle-lower reaches of the Yellow River. Situated 110"22"-116"38" east longitude and 31"23"-36"22" north latitude, it covers an area of more than 167,000 square kilometers. Henan has a continental climate of the North Temperate Zone, with hot, rainy summers, dry, inclement winters and windy springs. It has a mean temperature of 13oC-15oC, increasing from north to south, an annual frost-free period of 6-8 months, and a mean annual precipitation of 600-900 mm., also increasing from north to south. It is divided into 17 prefecture-level cities, 21 county-level cities and 89 counties, with a population of 92.56 million as of 2000, mainly including ethnic groups of Han, Hui, Mongolia, and Manchu. Liyu Beimian (Carp Covered with Baked Noodles in Sweet and Sour Sauce), Luoyang Shuixi (Feast Characterized by Its Soup in Luoyang Style), Songgong Miangao (Pastry Originating From the Imperial Palace of the Song Dynasty), etc. Yuju (Henan Opera) is the most important opera genre; other operas include Quju, Yue Diao, and Henan Zhuizi, etc. The traditional specialties are Henan embroidery in Kaifeng, Maojian Tea in Xinyang and Dukang Wine in Luoyang. 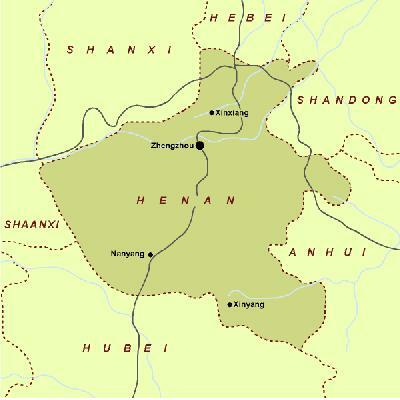 Yu is the shortened form of Henan Province, with Zhenzhou as the provincial capital. Henan (South of the River) gets its name from its geographic characteristic -- the greater part of the province is lying south of the Yellow River. Being one of the earliest developed regions in the country, it was a political and cultural center in ancient China. In the remote past, China was divided into nine geographical regions, and Henan was called the "Central Region" or "Central Plain" because it was situated in the middle of the nine regions. During the Song Dynasty (960-1279), Kaifeng of Henan was not only the political, economic and cultural center, but also one of the most prosperous international capitals. Henan has highly developed agriculture and industries. Its agricultural products of wheat, cotton, tobacco, sesame and peanut are among the most important in the whole country. Its output of coal and petroleum holds an important position in China. 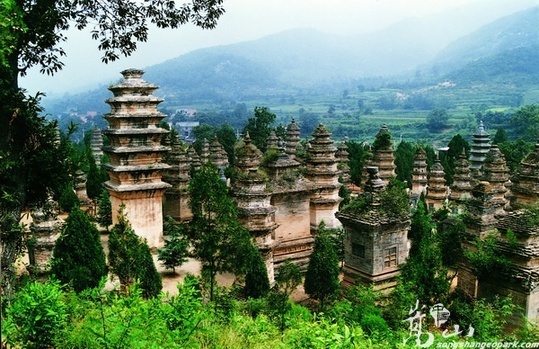 Henan, holding a very important position in Chinese history, abounds in tourist resources. The places of interest include Songshan Mountain, Jigong Mountain, the Imperial Mausoleum of the Eastern Zhou Dynasty (770-256BC), the White Horse Temple in Luoyang, the Longmen Grotto, the Chancellor Temple in Kaifeng, the Shaolin Temple in Dengfeng, the Zhongyue Temple and so on. Luoyang City of Henan is a renowned historic city, which was once the capital of 13 dynasties. It is recognized as the Capital of Poems for its abundance in literati and the Capital of Flowers for its typical flower peony.